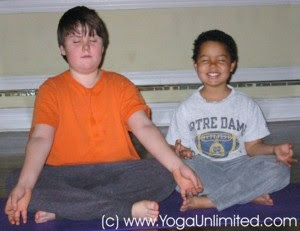 Yoga for Boys – Does Bribery Work or is it Silly? Home → Classroom Management → Attitude → Yoga for Boys – Does Bribery Work or is it Silly? Last week began another 9 week Kids Yoga Series at the community centre. One of the women in my adult yoga class had told/warned me she was going to register her son for the series. He’s a seven year old, full of energy, and terribly interested in video games, guns, and battles. In fact, she admitted to using bribery to get him to come. He doesn’t have to do homework on yoga days. Now I know this mom is a very loving and caring person who wants the best for her son. She has discovered the joy of yoga in her own life and she was willing to resort to bribing her son to open this experience to him. By the time the first kid’s class arrived I had built up a little drama in my mind about what he would be like. It is always harder to work with someone who doesn’t want to be in class. The good news was there was one other boy registered in the class, its easier when you’re not the only one. Plus there were three other girls. All between the ages of 5 – 7 years old, with the bribed boy being the oldest. One of the differences between adult and child yoga is rarely do adults call out funny words in the class – just because they are fun to say. Take for instance the word: Mustard. Mustard became my new friend’s word to add a bit of hilarity and funniness to the class, and he began saying it often. As a teacher you have to recognize what is happening. Mustard may well be the pivotal condiment in this boys enjoyment of yoga – or not. Is Mustard Allowed in Kids Yoga? When a child starts being silly he is also finding out what is going to be allowed in class and what isn’t. He’s looking for the boundaries and he’s also finding out whether I will ask him to behave differently than how he likes to be. Do I want him to be himself or become someone else? When I hear mustard repeated over and over – I have to make a choice to accept his offer for silliness or reject it. By rejecting the offer and insisting he stop, the class will be much like an adult yoga class. If I tell him to stop saying mustard (after all – saying mustard is not hurting anyone, in fact all the other kids found it hilarious) I tell him to stop being the kid he is. If he was doing something dangerous or mean – that would be the time to re-direct – but this kid was actually very sweet, sweet and silly! As a kids yoga teacher I have made it a goal to, at times, out-silly the silly. Become like a child and the kids will be amazed! Besides, I like being silly. There were many years when I lost the ability to be silly, let’s call it silly-ability, and I’m happy to have found it again. I think silly leads to creative and unusual thinking. Some of the world’s greatest inventions were probably considered silly by many people. When my new student said “mustard” and everyone laughed I accepted the offer. I said, “Oh Yummy, I love Mustard!” and I asked everyone if they wanted me to squirt some mustard on them (with my imaginary mustard bottle) when they did their yoga pose. Then I offered them relish, chocolate sauce, and sprinkles for the next poses. Each child accepted my offer, holding the yoga poses for a minute or more just to get an extra topping. What’s life without imagination? To finish the class we did bundle rolls down a row of mats (rolling on the floor like you would roll down a grassy hill). The kids love this pose and wanted to keep doing it – so we went on for about six minutes of bundle rolls till the kids rolled to a stop – happy and exhausted. If the kids really want to keep going in a pose then I let them whenever possible. Somehow, this week the silliness had worn off the word mustard – it was only mentioned once! Now, I’m not going to say whether bribery is good or not. But I do wonder if now that his friends are coming, will this boy will have to do his homework again? Tell me, what kind of silly stuff do you like to do? P.S. Hockey Silly Scores Goals: I can’t resist passing on this 30 second video from a professional hockey game a couple days ago. Another incentive why kids should keep their silliness – have you ever seen a goal scored this way?! Thanks for your comments. I'm glad imagination is valued by adults and kids too! This is one of the best blog posts I've ever read. I absolutely love your analysis of what you could have done when your "mustard student" was being silly (and what it would mean to your students) and your choice to "out-silly the mustard". I also think it's brilliant that you managed to turn the "condiments" theme into something that would help kids hold their postures a little longer (thus teaching them delayed gratification). Isn't it amazing how kids get so excited about IMAGINARY rewards?? We adults should take a page out of their books. I love your website and your teaching philosophies! A friend of mine has a son who attends your classes with amazing excitement! I belong to a training studio in Toronto (Roland Semprie Rosedale) that offers karate for kids, but also with a very wholistic approach (not your typical karate studio) … focusing on fun, imagination, concentration, positive social interaction, and so on. If you know of kids or parents that are interested in finding a martial art form (to complement their yoga) that would nurture and challenge them/their kids, tell them to check out Roland Semprie Rosedale!